Howdy! 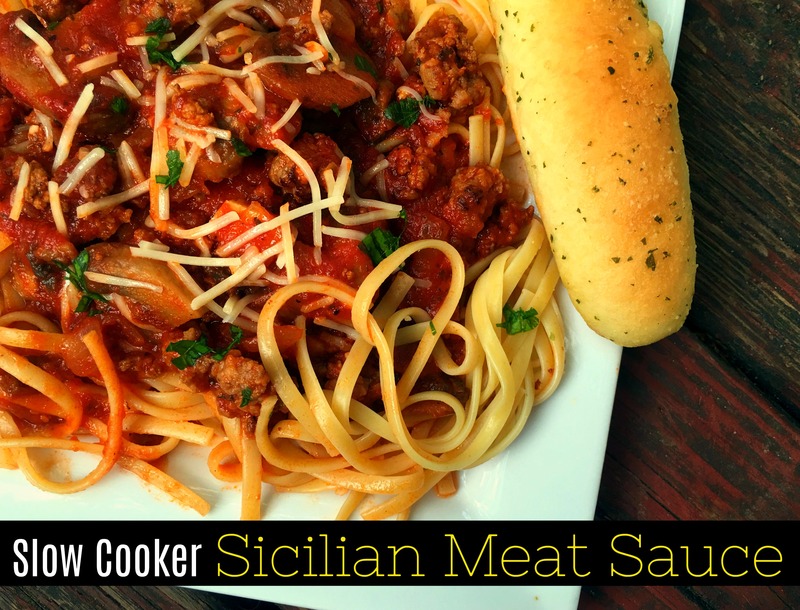 Sicilian Meat Sauce is our has become our favorite GO TO spaghetti sauce over this past year. We have it a few times a month. It is CRAZY delicious! I wanted to try and see how it would turn out in the crock pot and I AM SO GLAD I DID because it was INCREDIBLE and easy and PERFECT for a busy evening! ALL I had to do when we got home was boil noodles and bake up some frozen garlic bread and dinner was DONE. Click here if you would rather try the stove top version! I can’t wait for y’all to try this one! In a large skillet, brown sausage & ground beef. When it starts to crumble, add onions and mushrooms and continue cooking until the meat is browned. Add garlic the very last minute, stirring constantly. Drain off excess grease. Add the meat mixture to the crock pot and add water, tomato sauce, tomato paste, sugar, salt, parsley, basil, & ground red pepper. Cover and cook on low, for 5-6 hours or on high for 2-3 hours. Serve over cooked noodles with lots of fresh Parmesan cheese. Enjoy!